London, United Kingdom: Bantam Press, 2000. Book. Very Good. Soft cover. 1st Edition. First UK PROOF Edition, First Printing. 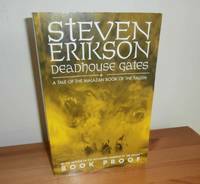 This is the very uncommon Proof copy of true first edition, first printing (first impression) of the second book in the series, a paperback original first published in the UK by Bantam Press. There is rubbing to the extremities, creases to spine and one to the lower front panel, the text is clean and unmarked it has clearly been read, very uncommon..